In this installment of Captain Obvious Log, we focus our attention on the Remote Desktop connection bar, a ubiquitous hallmark of every IT geek’s daily life. So, one would think every IT geek would know how to hide/display the connection bar depending on what is suitable for a given situation. Well, sometimes we can go about our daily IT lives, doing the same things over and over, and never looking for that simple solution. And sometimes we do find a nifty solution, but then we forget it just as quickly because it never quite reached the permanent flash RAM in our brains. I’ve become increasingly frustrated by my slow PC at work. So, today a colleague suggested I use a Windows 7 virtual machine as my “desktop,” then I can give it all the memory and CPU I want. Now, I had thought about doing this before, but what always stopped me was the fact that I have dual monitors, and I didn’t think dual monitors were supported in a Windows 7 Remote Desktop session. Well, apparently you can use dual monitors. I’m not sure if it’s only a feature of Windows 7 “Enterprise,” but that’s not really the point of this article anyway. 1. 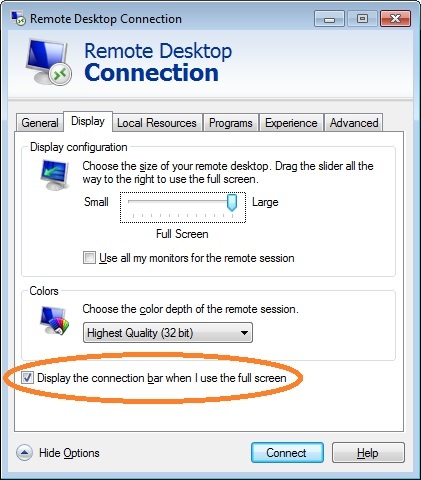 Edit the settings of your Remote Desktop Connection and click on the Display tab. 2. By default the “Display the connection bar when I use the full screen” is checked. UNCHECK it. 3. If you have your Remote Desktop connection saved to a file, make sure you head back to the General tab and save it. So, that’s great, no more connection bar. Hmm, but wait, without the connection bar, how do I get back to my local desktop? Voila! You now have a nice clean remote desktop session with no pesky connection bar, and you can easily get back to your local desktop when needed. Now do you understand why this qualifies for the Captain Obvious Log?